JESSICASMITHTV Success Story #2: Sam M.
We’re so excited to begin sharing some of our community members’ success stories with you. This week we’re thrilled to share Sam’s accomplishments — be sure to show her some love in the comments below! About Me: I am a 25-year old, 5’3″ Filipina living in Perth, Western Australia. I work in a metallurgical/minerals laboratory/plant that occasionally requires me to do some heavy lifting of up to 20kg loads. I have always wanted to be fit and have a better body but never really had the opportunity. My #JSTVFit Story: I tried running and soon realised it wasn’t for me. I increased speed/distance and never saw any noticeable result except for a slightly improved stamina. Eventually I would get bored during my runs, and sought something more enjoyable. I came across your channel and saw a MOTHER LODE (forgive the mining pun haha that is what I do) of different workouts to choose from. I love your happy demeanor despite the tough workouts; other trainers are just a tad bit too “aggressive-sounding” which can be a little frustrating and annoying sometimes. I love how the workout and the music you pick go hand in hand so I can just concentrate on my exercises rather than strain my neck trying to look at the TV. I feel as if you are talking directly to me and that really helps to get me to the finish line. Also, Peanut is very entertaining and that helps to get rid of any frustration! My Favorite #JSTVFit Workout: I love them all, and have a 3-week program based on your videos which I created myself, so that I don’t get bored and so I can do my favourite ones every week. If I did have an ultimate favourite, it would probably be SOLE SCULPT. I have been doing this once a week as part of my program since February and even though I have got it down pat, having also increased the weights I use, I still sweat buckets and feel the burn even in the middle of 4 degree weather (it is winter in Perth at the moment). I love to hate HIIT Cardio and Core because of the switch lunge jumps and spider climb pair! I still find it challenging and I am working on perfecting the entire workout, which is good because it means I still have somewhere to go. The best healthy living advice I can share is: I learned that fitness is a lifestyle choice, not something you do once and then simply maintain afterwards. It really has to be incorporated into your schedule. I eat most healthy most of the time, but never had to go on any specific diet during my journey. Fitness is so ingrained in me now that I find myself sometimes squeezing in a workout at midnight after a busy day because I simply just cannot NOT have my exercise for the day. I just got married on May 30 and am planning on having kids soon, and I know being fit and healthy will help me during motherhood, as well as the rest of my life. My most exciting results: Since starting this program last February 2015, I have become stronger and much leaner. The stubborn fat really shifted and I can finally see my abs which, in the 25 years that I have lived, I had never seen before! I went from 125 to 116 lbs, a mere 9 lbs in 7 months. I also find myself doing simple changes like taking the stairs instead of the lift, and carrying a basket at the supermarket instead of using a trolley. I can go to IKEA and load (and unload) all the heavy flatpacks into the car by myself! More than looking better in a bikini or skinny jeans, these are the little things that make me proud of my progress and lifestyle change, and I owe it all to you Jessica! Do you have a detailed day by day plan? I love Jessica’s videos but I need a routine and yours sounds awesome! 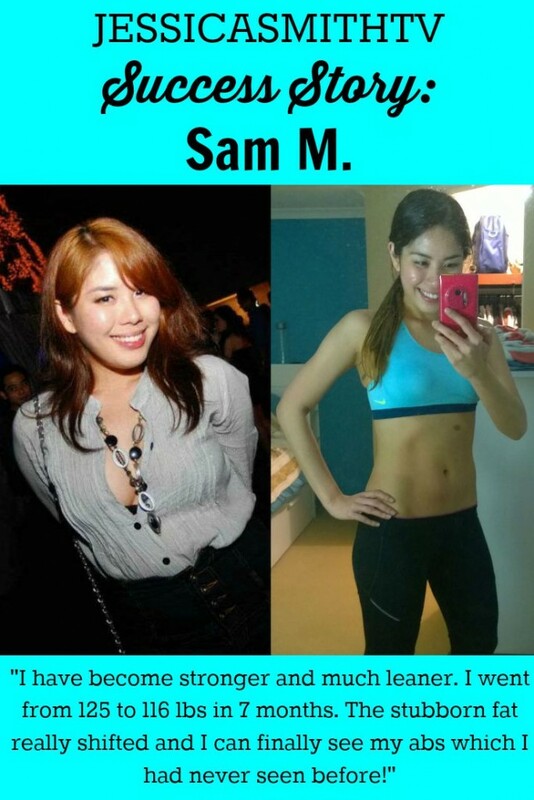 Sam, I was wondering if you have your detailed day by day workout plan available? I love Jessica’s videos but I need a routine and your plan sounds awesome! First off, congrats and you look great! Could you please tell me what your typical diet is like in a day, like what you have to eat, what your meals are like, etc.? Good for you Sam, you have the right attitude about health and fitness. It really is a lifelong commitment, and your family will learn to live by your example. You look so fit and healthy, congratulations! “I feel as if you are talking directly to me and that really helps to get me to the finish line. ” That’s exactly how I feel about Jessica’s workouts! Congratulations on your hard work and dedication, and the great thing is that it seems you’re having a lot of fun doing it. I’ve found, thanks to Jessica, that working out can be fun, and that’s a huge help. Your enthusiasm is contagious, thank you! Thanks Sam for sharing your story. I’m only 5ft 1″ and don’t have any weight to lose now but want to tone up and get stronger. I am amazed by your abs and you have given me the inspiration to continue. You look fabulous both inside and outside and I want to wish you all the best for your upcoming big day and beyond. Well done Sam you look fab. What videos did you use in you 3 week programme? Congratulations! That’s a wonderful success story and you look great! And I agree, becoming stronger and more fit is even more awesome! Congrats Sam! You look great, and you’re right, it’s a lifestyle choice! Congratulations on your success and your marriage! I know some people might think it’s strange that you said you started at 125 (wanting to lose weight), but it’s all a matter of proportion. I am like you…a half inch shorter actually, and every extra pound shows….Our dear friends and neighbors are Fillipino and we love the culture and the yummy food….Jessica’s workouts allow me to enjoy the fabulous feasts once in awhile without worries. Congrats Sam! You look fantastic! ~I learned that fitness is a lifestyle choice, not something you do once and then simply maintain afterwards.~ Yes! Thanks for sharing your success. I am glad to see I am not the only one squeezing a workout in late at night! Here is to a lifetime a fitness!